Cheap rent, high traffic, great food! Here is your opportunity to own a comfortable, very well received and easy to operate coffee shop cafe. Restaurant is located the heart of Fallbrook, this is an ideal area for anyone looking to settle into a comfortable city with a small town feel that lends itself perfectly to small businesses. Business is great and they close at 4:00 M-F and 2:00 on weekends! Great location, in a city where locals fully support small business, this place is fast becoming the LOCAL FAVORITE. Reviews are outstanding and location is on track to continue its current upward sales trends. With only word of mouth advertising and their easy to prepare menu items this place is now doing 18k plus per month in gross sales! 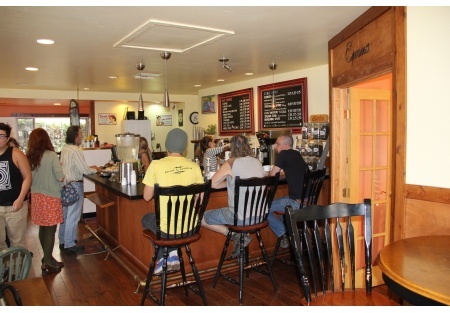 The café is on a busy corner intersection with good visibility, and easy in and out access. Comfortable and casual the country style decor makes this a great destination for all to come enjoy the great selection of coffee, smoothies. Sandwiches and more. It's a pretty simple business, serve a good product mix with a smile and your customers will return along with their friends. The current owners are satisfied with the sales they are doing and are ready to move on. Are you a people person with some marketing skills and a desire to own a successful café? This is the place for you. Fallbrook already loves this place and the demand is pent up for even better things, simply expand your hours and you have instant sales increases, do a little marketing including reaching out to the local churches and schools and your sales will sky rocket. This standalone cafe has two very nice patio areas. The main patio has a fire pit in the center, a soothing waterfall feature that customers come to relax and enjoy their meals by. They have created a serene environment for their customers to enjoy. Inside space is approximately 1000 square feet with another 600 plus outside. All this for only $1875 month. Rent even includes water and sewer. Current sales put monthly rent factor right at 10%; you can’t help but to make money with rent like this. If you are ready for a turnkey coffee shop/ cafe this is a great opportunity just waiting for the right owners to come in and take this place to the next level. Listing brought to you by Stone Path Brokerage Services. Expand hours for increased sales-demand is there!